"It's a dangerous piece of knowledge to possess, and it's well known that one murder leads to another." Morna Doris MacTaggert was the birth-name of "Elizabeth Ferrars," or "E.X. Ferrars," whose career as a mystery novelist spanned five decades, from 1940 to the mid-1990s, during which she wrote over seventy crime novels and numerous short stories – some of them were posthumously collected (e.g. The Casebook of Jonas P. Jonas and Other Mysteries, 2012). Ferrars has been called the closet of all mystery novelists to Agatha Christie in "style, plotting and general milieu," but I suspect this to be an arbitrary, superficial comparison similar to how the late P.D. James was once heralded as her "Crown Princess." They were female mystery writers who were, at one point in time, contemporaries of one another, which is where the similarities come to a halt. I've read only two of Ferrars' detective stories, but I think the subject of this blog-post showed a writer who fundamentally differed from Christie. As well as poking the popular notion that detective stories from the Golden Era only dwelled in the stuffy, hearth-warmed drawing rooms of ancestral mansions in the eye. I, Said the Fly (1945) was published in the final year of World War II, but opens in 1941 in a bombed-out street in London and proceeds to tell the story of what happened there in the year preceding the war. Before the bombs, Little Carberry Street had already lost a lot of its eighteenth century respectability and became dominated by the squalor of the poor. The windows were hung with "curtains of soiled yellow lace," bug-infested rooms and the street "filled by the shrill voices of swarms of illdressed, underfed children" and the disturbing "singing of homegoing drunks" – interspersed with "screams and shouts" and "fighting in the street." Kay Bryant found herself occupying a cheap bed-sitting-room on the top floor of No. 10 Little Carberry Street after she drifted away from her husband and had an "extreme shortage of money." She returned to the place "to see what the blitz had done to it" and began to remember the grim, horrifying events that took place there. It began when Kay's neighbor, Pamela Fuller, convinced their landlady, Miss Lingard, to install a gas-fire in her room, but the gas-fitters found something beneath the floorboards that delayed the job: a revolver swaddled in a dust cloth! The firearm is linked by the police to a murder that occurred a fortnight before the floorboards were lifted: a naked, mutilated body of a woman, shot through the heart, was discovered on Hampstead Heath and the victim is identified as a former tenant – which makes it very likely that the murderer is an occupant of No. 10. There are more than enough potential suspects for Inspector Corey to review. Tovey is the caretaker of the place who shuffles around the place to make "symbolic gestures of cleaning" and can usually be "found outside a door or round a bend in the staircase," which does not make him a very popular figure. He often verbally abuses Miss Lingard, but excuses him as being "quite a character" and "had trouble with his poor old head" after being wounded in World War I. Ted Hay and Melissa Ivory share a room and live a "dark life of sin." Hay makes his loving "in a hand-to-mouth fashion on the edge of the world of journalism" and "knew who was going to marry whose wife" or "who was homosexual." Ivory was simply "a very odd person" and attempting to figure her out got nobody anywhere. Charlie Boyce is a tenant on the first-floor and loves to wake everyone up whenever he has forgotten his latch-key and Kay would not be surprised that his whole existence was made up of "one unmentionable crime after another." Mrs. Flower lives on the ground floor and "loans her front room to a lot of her girlfriends and their gentlemen acquaintances," which presumably comes with "a commission on the transaction" that helps her pay the rent. Well, I said Ferrars did not struck me as an Agatha Christie-type mystery writer and the backdrop, characters and even the plot of I, Said the Fly can testify to that. However, Ferrars was still a product of the Golden Age and that becomes very evident towards the end of the book when some of the characters begin to draw-up dummy cases against each other, which was (plot-wise) my favorite part of the book – because I liked them better than the eventual explanation. Not that the solution was thoroughly bad, or anything, but I simply enjoyed how the characters were airing their suspicions and attempted to make the evidence fit their pet-theories. I was pleasantly reminded of Anthony Berkeley! But it also made the real explanation somewhat underwhelming. So don't expect an Agatha Christie-tier rug puller that'll leave you dumbstruck with surprise, but I would still warmly recommend the book to the loyal readers of the Crime Queens who have nearly depleted their pile of Christie, Dorothy L. Sayers, Ngiao Marsh, Christianna Brand, Margery Allingham, Gladys Mitchell and the others. I'd wager the backdrop op the story will be interesting to genre historians and scholars of popular culture, because it goes contrary to the image a lot of people have of a British whodunit from the 1940s. "There was a bang, a plock, and a hiss, then a smell of beer incongruously spreading into the air." 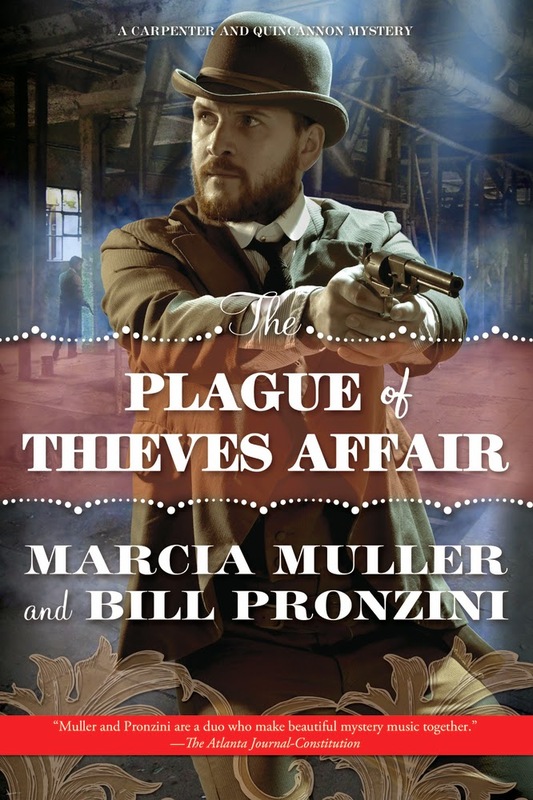 The Plague of Thieves Affair (2016) is the fourth in a series of historical mystery novels by Bill Pronzini and Marcia Muller, which began with The Bughouse Affair (2013), but originated in a Western-style novel, Quincannon (1985), that spawned a long-running series of short detective stories – some of which were collected in Carpenter and Quincannon: Professional Detective Services (1998). John Quincannon and Sabina Carpenter solved a preponderance of their cases in magazine stories and the basic structure of the plot of The Plague of Thieves Affair seems to hark back to the short story form. There are a number of cases in the book that solved without wasting any time and could easily stand by their own as short stories. The Plague of Thieves Affair embarks with Quincannon nearing the final stages of an investigation at Golden State Steam Beer. Owner of the brewery, John Willard, engaged the services of Quincannon to probe the bizarre death of the head brew-master, Otto Ackermann, who had been stunned with a blow to the head and pitched into a "vat of fermenting beer to drown" – which differs from the scenario of a freak-accident that the "incompetent minions of the law" had pieced together "after a cursory investigation." Obviously, the motive was the appropriation of the brew-master's secret recipe and implicated a rival brewery lead by "a morally bankrupt businessman." Meanwhile, Sabina Carpenter has a meeting with several clients: Marcel Carreaux and Andrew Rayburn are the first arrivals. Carreaux is the assistant curator of the Louvre Museum in Paris and Rayburn is the owner of the "well-regarded Rayburn Art Gallery on Post Street," who were brought together by an exhibition of "rare and valuable antique ladies' handbags" – dubbed "Reticules Through the Ages." One of the items on display is the Marie Antoinette chatelaine bag, valued at several thousand dollars, which requires special protection because "thieves abound in the Barbary Coast." It's the reason why they approached Carpenter and Quincannon. A dandy, "gay blade," by the name of Roland W. Fairchild, is the second client of the day and he wants to hire the agency to find his missing cousin, Charles P. Fairchild III, who became the sole inheritor of a multi-million dollar estate and Carpenter is "uniquely qualified to locate him" – since the patrician-sounding cousin is none other than the scattered-brain, bughouse Holmes who made his first appearance in The Bughouse Affair. A growing case-load, but manageable as long as complications are kept at bay, which is not going to be case. Quincannon practically has the murderer by the scruff of the neck, but the person has cornered himself inside a building that houses the utility-and storage rooms. There are two solid oak doors, "installed as a deterrent to both rodents and human pilferage," separating Quincannon from his quarry. However, the report of a gunshot is heard inside and when the doors are finally opened they find the body of the suspect sprawled on the ground: a gunshot wound in the chest and a revolver near at hand. Quincannon privately scoffs at the idea of suicide, but murder requires a gunman and nobody was found hiding in the storage room. It was Quincannon who stood guard at the only door giving access to the rooms and heard the gunshot. But nobody entered or left the room while he was standing there! It's a classic locked room murder, but not a particular difficult one to explain and this plot-thread soon becomes part of a chase-type of story, in which Quincannon pursues a second, slippery customer with bloody hands and attempts to locate the stolen recipe – which brings him to several interesting locations and comes across some colorful folks. However, Sabina is faced with a number of complications as well as a seemingly impossible problem. During the exhibit of the antique handbags, the lights are extinguished for "a period of no more than two minutes" and when they came on again the Marie Antoinette bag was gone! All of the exits were guarded, but a thorough search of the premises failed to retrieve the stolen handbag. Luckily, the crackbrain Sherlock turned up again to help Sabina wrap up the case in record-time. Sabina was also hired to find the self-proclaimed Holmes by supposed relatives of him, but that soon developed in a case of murder with the bughouse Holmes as the chief-suspect, which they also solved within the length of a short story – and could have easily been called, "as the good Doctor Watson might have" titled it, "The Adventure of the Wrong Detective." It's these short story-like plot-threads, in combination with the compartmentalized nature of Quincannon's investigation, that gives the impression of reading a collection of short stories converted into a novel with bridging material. Pronzini has done that previously with Scattershot (1982), but I'm not sure if a similar route was taken with The Plague of Thieves Affair. However, the rather unfortunate result is that The Plague of Thieves Affair comes across as a relatively minor series-entry, which mainly contributed character-development to ongoing story lines – such as the back-story of the bughouse Holmes and the relationship between the series protagonists. 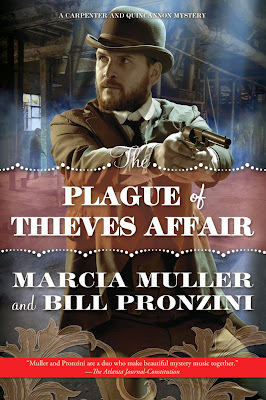 As a fan of the series, I very much enjoyed reading The Plague of Thieves Affair, but, judged purely as a mystery novel, it's a notch below the previous books in the series. During the first couple of years on this blog, I read a whole slew of historical mystery novels from a very prolific scribbler, Paul Doherty, but the flood was stemmed to a trickle by the rapidly expanding gamut of procurable Golden Age and neo-classical mysteries. I've read only two of Doherty's historical fancies in just as many years: The Nightingale Gallery (1991) and Song of a Dark Angel (1994). So I thought a return to his work was in order and picked the inaugural novel in what seems like a very promising series. A series that'll see me back before 2017 rolls around! 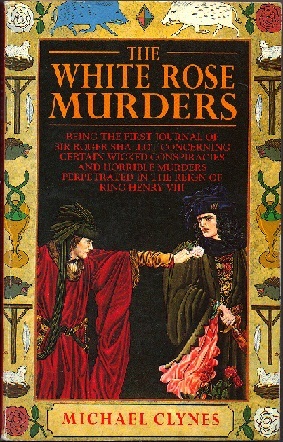 The White Rose Murders (1991) was the first in a series of six, originally published under the nom-de-plume of "Michael Clynes," which all have the long and descriptive subtitle of "Journal of Sir Roger Shallot" that concerns "certain wicked conspiracies and horrible murders perpetrated in the reign of King Henry VIII" – a premise pregnant with promise and vast possibilities. Sir Roger Shallot was "born with the quickest wits" and "fastest legs in Christendom," who has probably bedded as many women as a certain Mongolian warlord, but has a profound lack of courage and often took what he could carry. Usually valuables that did not belong to him. Shallot has not led an altogether honorable life, but one that brought him to his ninetieth summer and not everyone was able to reach that pinnacle in the 16th century. However, in his old days, Shallot has become a haunted man as the "clip-clop of spectral hooves on the peddle-strewn path in front of the manor" herald the ghosts of his pasts as they form an "army of silent witnesses" around his bed – taunting him with jeering cries of being a liar, thief and a coward. Shallot tells the story behind these ghostly faces as he dictates his memoirs to a chaplain in the center of a maze, which protects him from "the importunate pleadings" of his "brood of children" and the "soft footfall of the assassin" from one of the many secret societies who'd like to see him depart from the world. You'll understand why once you learn his story. Shallot has a penchant for landing in trouble and making the occasional enemy on the side. 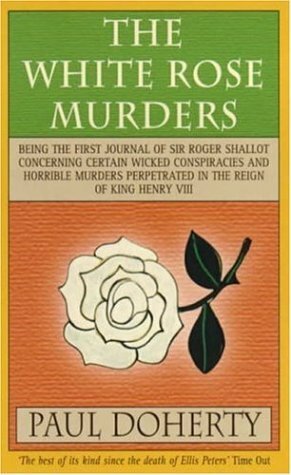 First of all, The White Rose Murders is an original story that tells of Sir Roger Shallot's humble beginnings: a child born during a time of terror "when the great Sweating Sickness swept into London" and Henry VII reigned over the country, but a life of mischief in bad company nearly condemned him to death by hanging and was saved by an offer to enlist in the King's Army to march against the Scots – where he "hid beneath a wagon until the slaughter had finished" and "came out with the rest of the English Army to claim a great victory." Well, being a "war hero" did not prevent Shallot from a second meeting with the hangman, but this time he was spared by interference of an old and influential school friend, Benjamin Daunbey. Daunbey is the favorite nephew of Cardinal Wolsey, the ruling scepter in the hand of King Henry VIII, who took Shallot as his manservant and through this connection they become encumbered in a Royal assignment. A potential deadly chore that began when James IV of Scotland is killed on the battlefield of Flodden and his widow, Queen Margaret, fled to England and had to leave her infant son behind under a Council of Regency. Queen Margaret is the sister of Henry VIII and seeing her restored to the Scottish throne is in the best interest of England, which brings Shallot and Daunbey in the picture: Cardinal Wolsey has imprisoned Alexander Selkirk, "formerly physician to the late King James," to draw information from him that could assist Queen Margaret's return to Scotland and he's suspected of being a member of Les Blancs Sangiers – a secret coven of Yorkist conspirators that plots the overthrow of the Tudor Monarchy. The only obstacle to obtaining this information is the fact that Selkirk's mind has wandered away from him and spends his time writing "doggerel poetry" and staring "blankly at the walls of his cell," which is not very helpful. But he was still considered a danger by some. One morning, Selkirk's is discovered dead in his prison cell, "brutally murdered by poison," but the question is how the murderer managed to administrate the deadly potion: the door of the chamber was locked and bolted. There were two guards at the foot of the steps and two who stood outside the prisoner's chamber. Guards who tasted every scrap of food and sipped every drop of claret that entered the room without showing any signs of the ill effects of poisoning. The murder room had high-up, arrow-slit windows inside a sheer wall of thirty feet, but these proved minor obstacles to an apparently ghost-like killer who also left white rose on the victim's desk – The White Rose of York and the mark of Les Blancs Sangliers! Shallot and Daubney find themselves confronted with an entire string of murders, containing a second impossible poisoning in a sealed chamber, which they suspect sprang from the inner-circle of Queen Margaret's household. A suspicion that's confirmed when they join the Queen’s retinue to meet a Scottish envoy to negotiate her return to Scotland, but murder is dogging their every step: from a lush priory and the vile back alleys of London to the City of Paris, which "seethes like a hissing snake" and "full of intrigue, subtle plots and traders who could cheat a beggar out of his skin" – which makes you wonder how Shallot managed to life for nearly a full century. Doherty handles all of these plot-threads with remarkable skill and strewn about ample clues to many of the proposed mysteries, which were hidden in a scrap of poetry, a cat who refused to die and the embalmed corpse of King James. The locked rooms were handled equally well and the explanations for them were quite acceptable and reasonable. Not the best examples the genre has to offer, but they were still pretty good and poisonings in locked rooms are difficult to pull off convincingly. I guess the only point I could bring against the plot is that the murderer had nearly dissipated the small pool of suspects by the end of the book, which made this person stand out, but even that compensated by the fact that Daubney suspected the wrong person. You should discover for yourself why that point is important. However, the most attractive feature of The White Rose Murders is Shallot's delightful narrative, which is often interrupted to rebuke the chaplain for sneering at his cowardice or calling him a hypocrite for condemning his loose morals. Shallot's narrative is also interspersed with such prosperous claims as having met one of the Princes in the Tower (who was supposed to be dead) and having been friends with William Shakespeare! In summation: The White Rose Murders has a soundly constructed, reasonable clued plot that's wrapped in a grand and amusing narrative, which is told by what's arguably the best character Doherty has created. It's a pity he was abandoned after only six novels, but I still have six of them to go and I'll be eliminating some of them from my TBR-list before the year draws to an end. "...an engineered death is merely a polite euphemism for murder!" Max Afford was an Australian playwright and novelist who was previously discussed on this blog when I reviewed a slender volume of short fiction, Two Locked Room Mysteries and a Ripping Yarn (2008), which included a pair of stories featuring his series characters – a genius amateur, named Jeffery Blackburn, and the laconic Inspector Read. 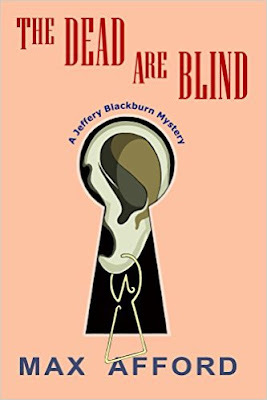 Blackburn and Read appeared in roughly half a dozen full-length novels and four of them were catalogued by Robert Adey in Locked Room Murders and Other Impossible Crimes (1991). You'd assume that would make Afford's work of special interest to devotees of impossible crime fiction, but even now that they're readily available again, they continue to be fairly obscure and overlooked by locked room enthusiasts. So let's change that and take one of them for a test-ride. The Dead Are Blind (1937) is the third entry in the Blackburn series and Afford drew on his own experience as a producer and writer of radio-plays, which furnished the plot of the story with an interesting backdrop. The story begins with Jeffery Blackburn reflecting how the evenings have become rather dull, because "all the super-criminals appear to have turned their nefarious attentions to dinner-hour radio thrillers." Luckily, Read was supplied with invitations for the opening of a new subsidiary studio of BBC. A radio-play will be performed during opening night, entitled Darkness is Danger, which is produced by a former talkie-director, Carl von Bethke, who brought an innovative perspective from the big screen to the radio studio – innovations that nearly provided a cover for an almost perfect crime. Near perfect is a key phrase that perfectly sums up the events preceding the opening of the studio: a technical break-down occurs between the special effects room in the basement and the dramatic studio, which means that the effect will have to be done in the same studio as the artists. Just as it was "in the early days of broadcasting." However, one of the stars of the show, Olga Lusinska, raises proper Hell over these improvisations and refuses to "act among brooms and buckets and mops," but these are minor snags compared to what happened during the live broadcast. There's a scene in the radio-play in which the characters are "plunged in darkness" and in order to strengthen the effect the lights are dimmed in the studio, but when they come back on there’s somewhat of a problem: the twisted body of one of the actresses, Mary Marlowe, lay on the floor of the studio. The key to the door of the dramatic studio is firmly clasped in one of her cold, stiffened hands, which prevented anyone from entering or leaving the room. A doctor pronounces the death of Mary Marlowe to be "one of the best authenticated cases of heart failure" he had "ever seen," but there are several dissenting voices who suggest they might be looking at the end results of an audacious crime – which include Blackburn and a close-friend of the victim. Initially, Blackburn suspects the cause of death might be one of those forbidden and untraceable poisons, but a long and intensive post-mortem examinations yields surprising results. Slowly, but surely, the layers covering up the method are peeled away and the plot begins to resemble a proper, classically structured locked room mystery. Showing how the murder was a locked room killing actually answered the question of how it was carried out, which is an unusual, but clever and original, approach to the locked room problem. Never seen that route taken before that I can remember. The idea behind the explanation anticipates one of John Dickson Carr's locked room novels and is tangibly related to a non-impossible crime mystery I reviewed very recently on here, which was helpful in gauging the nature of the method. The set-up of this well disguised locked room murder, subsequent investigations and eventual explanation covers the first six and best chapters of the book. What follows is digging around in the past of the victim, which involved a fatal fire, dope smuggling, coded messages and two more murders that reeked of offal to pad-out the story, but Afford redeemed himself in the end – since they stuck to the main plot better than I expected from their presentation. The method for the second murder could've easily been presented as a quasi-impossible crime, if done in a public place with lots of eyewitnesses, and was foreshadowed in the early chapters of the book. And the third body is a classic one that threw me off the scent of the murderer for a brief moment. So they hardly qualify as padding and that was pleasantly surprising. I was not as thrilled by the spot of danger Blackburn found himself in, which had the murderer cartoonishly confessing to everything and promising that "if it is the last thing" this person does "upon this Earth," but Blackburn was going to end up somewhere were he'll not be able to do any of his "damned investigating." So, all in all, The Dead Are Blind has an original structured locked room plot insulated by a fairly decent, if not always perfect, detective story, but as a whole it's well worth a read. "There's the danger of making theory fact. And the full story wasn't told. When is it ever? Well, whatever the truth of that business, old man, from now on the open mind is going to be no mere figure of speech for you and me." Last year, I reviewed Annie Haynes' final and posthumously published mystery novel, The Crystal Beads Murder (1930), which was completed upon her untimely passing by an uncredited colleague and currently the assumption is that the finishing touch was done by "Anthony Gilbert" – who would became an accomplished mystery novelist herself in the succeeding decades. Shamefully, I began to neglect Haynes as soon as I discovered her and several months had to pass before I returned to her detective fiction. 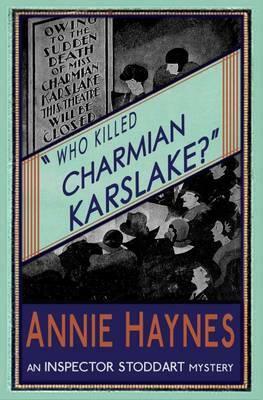 Which brings me to the subject of this blog-post: Who Killed Charmian Karslake? (1929). The book was another posthumously published novel, but one Haynes was able to finish before passing away. I picked this particular book on the assumption that it was a detective story with a theatrical background, but it turned out to be an old-fashioned, village-type of mystery such as the one I previously reviewed. Scenery of Who Killed Charmian Karslake? is a "quaint old spot," a tiny and quiet village named Hepton, where the Penn-Moreton family is perked on the top rung of the social ladder as "the little tin gods of the town." Hepton Abbey is the ancestral seat of the Penn-Moreton’s and was bestowed by King Henry VIII "upon his reigning favorite," during a period known as the Dissolution of the Monasteries, which was turned in "something of a showplace" without too many sacrifices to its original ambience – high-up, diamond-paned windows, thick walls that are "un-desecrated by modern prints" and rooms that had once served as monks' cells. It's a place that lends itself perfectly to guided tours whenever guests are being entertained, but the showpiece of the latest house party at Hepton Abbey is one of the visitors. The great American actress, Charmian Karslake, who had taken London by storm had surprisingly accepted an invitation from Lady Moreton to attend the party. She had "refused all others since coming to England," but apparently accepted this one on account of her enormous interest in "antiquities of all kinds" and the "Abbey is distinctly unique." After all, Karslake wears an old and valuable necklace, often spoken of as her "sapphire mascot," which was once in the possession of the "ill-fated Paul of Russia" and "the murdered Queen Draga of Serbia." Karslake had been warned that misfortune stalked the owners of the sapphire ball and could potentially attract the "cupidity of some of the criminal classes," but she laughed at the very notion of her mascot bringing her bad luck – which is exactly what it seems to have to done. Charmian Karslake fails to make an appearance at the breakfast table the following morning and the door to her bedroom has to be broken down, which reveals a room in confusion and the body of the famous actress laying on the bed. She had been shot while struggling for her life. The local police appealed to Scotland Yard and they dispatched one of their best minds, Inspector Stoddart, to the scene of the crime. Inspector Stoddart is confronted with a very respectable cast of potential murderers: Sir Arthur Penn-Moreton and Lady Moreton. The younger brother of the Lord of the Manor: Richard "Dicky" Penn-Moreton and his wife Sadie, daughter of Silas P. Jugg, the "canned soup magnate" from America who observes that "British sleuths seem to be a bit backward" and cabled one of the "sharpest sleuths in the States" to make the crossing, but J.B. Harker sadly never makes an appearance. I would've loved a race to the solution between two detectives. Anyhow, a friend and barrister of the family, John Larpent, his fiancée, Paula Galbraith, and Karslake’s French maid, Celeste, further round out the cast of suspects. However, Stoddart realizes that, in order to answer the titular question, he has to discover who Charmian Karslake was in a prior life, because she seemed to very familiar with the village for a stranger. She also spoke with a man during the party whom she called Peter Hailsham, which was the name of a "rag-and-bone picker" who sold mixed sweets and bottles of ginger-pop, but has been dead and buried for decades. And the man Karslake spoke with vanished after the party. I think Stoddart's excursion into the past and reconstruction of Karslake's true identity makes up the best parts of the book, which deserved a better and stronger conclusion. Haynes was rather vague or even contradictory about certain plot-details: when the body was discovered it was pointed out there were "two tiny burnt holes in the midst of the red stain," but the ending mentioned only one "sharp pop." Than there is the question of the locked bedroom door: did the murderer lock the door after the deed was done or was the key "knocked out of the way when the door was broken open," but, if the key was still on the inside of the door, then how did the murderer manage to escape from the bedroom? A police microscope confirmed that nobody left the room through the window. And, no, the scientific principle behind that conclusion was never explained either. I wonder if Who Killed Charmian Karslake? was not entirely completed upon Haynes' passing and someone else had to come in to dot the I's and cross the T's, but overlooked these small, unanswered plot-details in what appeared as a nearly finished manuscript. What really finished the book for me was the person who was picked to fulfill the role of murderer. It felt as a rather arbitrary choice and the moment I realized this person was the murderer I cringed. Cringed really, really hard. So, in summation, I enjoyed a large swath of the story, but the plot collapsed in the final chapters, which is a shame, because it started out as a really good detective story. "The fury of a demon instantly possessed me. I knew myself no longer. My original soul seemed, at once, to take its flight from my body; and a more than fiendish malevolence... thrilled every fiber of my frame." In recent weeks, I've been exploring the works of Robin Forsythe, an ex-convict-turned-writer, who completed his first mystery novel, Missing or Murdered (1929), while serving a term of imprisonment for defrauding the British government. Seven additional novels would follow before he passed away in 1937. Forsythe was born in 1879 and you can catch an occasional glimpse of the ghosts of the sort of crime-fiction he probably read during his formative years in the waning days of the nineteenth century, but they're compelled to obey the rules and conventions of the Golden Age – as well as sharing that era's deep appreciation for clever and ingenious schemes. The large-scale plots encircling the inexplicable death of Mrs. Mesado in The Pleasure Cruise Mystery (1933) and the extraordinary pair of corpses in The Spirit Murder Mystery (1936) can attest to that claim. The Ginger Cat Mystery (1935) was the fourth entry in the Anthony "Algernon" Vereker series and published in the United States as Murder at Marston Manor, which turned out to be far more accurate book-title. Granted, the second title is a bit dull and unimaginative, but spot-on as Forsythe strayed down a winding path that lead straight to a manor house mystery in the grand old English tradition. A small village, Marston-le-Willows, in West Suffolk is the backdrop of The Ginger Cat Mystery and the home-county of Mr. John Cornell, who moved to London as a teenager and accrued a considerable fortune as a merchant, which allowed him to retire at sixty and buy Marston Manor – where he planned to settle for "the remainder of his days" in "peace and seclusion." However, the peace-part is not to be taken as a synonym for a sedentary life. John Cornell became a widower in the years preceding his retirement and "his frozen sedateness" began to thaw "in the autumn sunshine of his years," which simply translated to having "a high old time." He began to wear brighter clothes, attended opera and theatre performances, frequented nightclubs and acquired a sumptuous houseboat – which he renamed from "Mayfly" to "Mayfly But Can't." Naturally, this rejuvenation cumulated in a marriage with a much, much younger woman. Josephine Rivron is a friend of Cornell's son, Frank, who, according to local gossip, was "in an unseemly hurry" to get her hands "on the loaded Cornell coffers," because she gave the son a pass and married the old man instead. Regardless, the marriage appeared as a happy one, but tragedy pried them apart: Cornell fell ill and passed away due to pneumonia. There are, however, whispered rumors implying Cornell's unexpected passing was due to poisoning and this lead to an "exhumation by lamplight," but the results were profoundly disenchanting to the village rumor-mill. But then a bone-fide murder occurs! One early morning, the body of Frank Cornell was found on the half-landing of a staircase leading to the first floor of Marston Manor: he had been shot through the right eye. This brings Inspector Heather and Anthony "Algernon" Vereker to the scene of the crime, which is where the book begins to differ from the other ones I have read. In the previous books, the dialogue between Vereker and Manuel Ricardo resulted in a flippant and quippish narrative, but the latter is largely absent from the story – giving the overall story a different and more serious dynamic. Vereker spends most of his time interviewing suspects and poking around the crime-scene, which squarely places the book in the "mainly conversation" category and somewhat of a disaster to review. However, my poorly written review should not reflect badly on the book. I very much enjoyed it as a pure, if slowly moving, detective story, but one that's hard to sum-up without giving too much away – which is why this blog-post is horribly overwritten (i.e. padding) without as much as a glance at the plot and characters. However, I'll say this about The Ginger Cat Mystery: one of the strongest and weakest aspects of the plot is its dedication to fair play, which sounds contradictory, but allow me to explain. Halfway through the story, I had one of those moments that convince me that I'm brilliant armchair detective stuck in the wrong universe. All the pieces of the puzzle fell into place: a supposedly haunted music room, a missing set of duplicate keys, a vest pocket automatic pistol and a conspicuous groove on the bullet. I knew who the murderer was, how the murder was carried out and why, but the problem was that I still had half a book to go through. I don't know if it was because I had figured everything out by the halfway mark, but I spotted the final twist from a mile away and "the clue of the ginger tabby," in combination with the false explanation, cemented my conviction that I was 100% spot-on with my solution. Well, I was right. 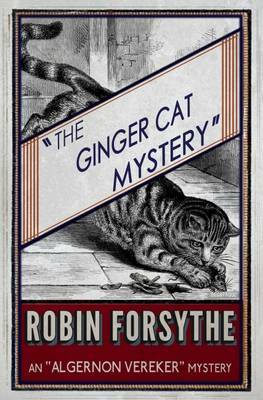 So, all in all, a clever constructed and fairly original detective story that plays scrupulously fair with the reader, but the plot was dressed in a plain and conventional suit, which may be the only serious drawback to a mystery novel that has the name of Robin Forsythe emblazoned on its cover. Hopefully, I have something substantially better written for my next blog-post. So don't touch that dial! "Geez awfully quiet, dang, I wonder if there anymore hunters out here this mornin'"
In the final days of 2014, I wrote a blog-post, "The Renaissance Era of Detective Fiction," proclaiming that the dawn of a new era peeked over the horizon and the subsequent twelve months has shown an invigorated interest for the Golden Age detective novel – an interest shared by both readers and publishers. A whole slew of obscure and long-forgotten mystery writers were unearthed in 2015: John Bude, J. Jefferson Farjeon, Annie Haynes, Ianthe Jerrold, Lenore Glen Offord, E.R. Punshon, Harriet Rutland and HarperCollins' re-launch of The Detective Club. 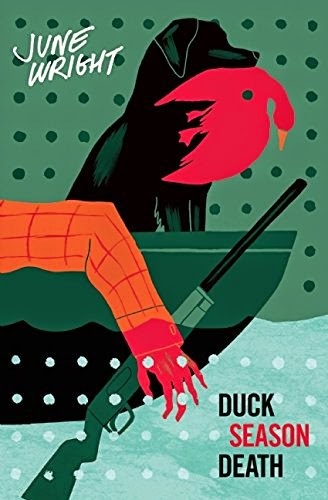 One of the lesser-known, unfairly forgotten names in this deluge was that of an Australian mystery writer, named June Wright, who finally had one of "lost" novels published last year: Duck Season Death (c. 1955). June Wright was a mother of six children and combined a career as a spouse with that of a mystery novelist, which is an occupation she crammed in the two or three hours that were left to her in the evening. The results were six books, published during the tail-end of the Golden Age, which began with Murder in the Telephone Exchange (1948) and ended with Make-Up to Murder (1966). But there were two more mystery novels that were never published in Wright's lifetime: Duck Season Death and The Law Courts Mystery. Unfortunately, The Law Courts Mystery was never published and the manuscript is now considered to be the lost, but Duck Season Death was saved from a similar fate and appeared in print for the first time 2015 – courtesy of Verse Chorus Press. Duck Season Death, alternatively titled The Textbook Detective Story, was rejected on the basis over several critical reports from so-called test readers, who labeled a purposely classically-styled, somewhat tongue-in-cheek detective story as a "stock-box novel of the whodunit house party variety" with "mechanics" that "follow the old lines of the country house murder." Well, it's this kind of utter nonsense that led to irrevocable lost of a number of unpublished manuscripts by the likes of Joseph Commings, Glyn Carr, C. Daly King and Hake Talbot, which can not be tolerated in this new Golden Era. I suggest we find these court jesters, whether they are dead or alive now, coat them with tar and toss them into a gibbet cage. Anyhow, on to the story at hand! The tragic hero of Duck Season Death is Charles Carmichael, the crime-fiction reviewer for Culture and Critic, which is a small, but influential, literary quarterly owned by his uncle – the detestable and hateful Athol Sefton. Lamentably, Carmichael finds himself shackled to his uncle's company for a spot of duck shooting at the Duck and Dog Inn, but Sefton has made himself a target of the scorn of every guest at the hotel. As the readers knows from the introductory chapters, some of them had a motive to take a shot at him before they bumped into him at the place. So is at any surprise when a stray bullet puts an end to Sefton? Carmichael is convinced that his uncle was "deliberately and cleverly murdered," but here is where the plot begins to diverge from your dime-a-dozen country house murder mysteries with a closed-circle of suspects: nobody believes Carmichael. The authorities and locals assume Sefton came to his end as a result of a shooting accident, because "every season there is some fatality or other like this" and is often reprimanded for insisting a murder has taken place – even publicly by the corner during the inquest. Of course, it's suggested that Carmichael has read too many detective stories. As if there’s such a thing as reading too many detective stories. Well, as you can see, I enjoyed reading Duck Season Death, but I have to fulfill my duties as a dreary, disgusting armchair critic by pointing out that the fair play factor is a bit dodgy. The motive is foreshadowed, but not revealed until the final part of the story and this makes it very difficult to settle on a murderer. However, when it's revealed and you keep some of the clues in mind, you should be able to foresee the final twist. So technically it's a completely fair play mystery, but it took some time in getting there. Stylistically, I also have to note that the book differed in one aspect from other Australian mystery writers I've read, namely Arthur W. Upfield and S.H. Courtier, which strongly evoked the backcloth of their stories and made you believe the sort of crimes they wrote about were indigenes to Australia – and could have only taken place down under. I did not have that feeling with Duck Season Death, which could have just easily been set in England or America, but that's a minor and personal quibble. Finally, in spite of having reissued this forgotten, nearly lost detective novel, I have to castigate Verse Chorus Press for not re-titling the book as A Rejection of Murder, because it would've perfectly fitted both the back story of the book's publication and the plot. However, you should not allow the probing and nitpicking from dismal critics, from past or present, to spoil the fun of this book, because I'm sure seasoned mystery readers will enjoy this unusual ripple in the traditional closed-circle of suspects story. But judge for yourself. I'll certainly be returning to Wright's work in the near future to see what she was capable off in her debut novel. Only a few days ago, I reviewed The Pleasure Cruise Mystery (1933) by Robin Forsythe, which was recently summoned from its perennial slumber in the dark abyss, commonly referred to around these parts as "biblioblivion," by publisher Rupert Heath and genre-historian Curt Evans – who furnished all of the Dean Street Press editions with insightful introductions. I was sufficiently pleased with my introduction to Forsythe's work that I wanted to read another one of his mysteries as soon as possible. I was torn between The Ginger Cat Mystery (1935) and The Spirit Murder Mystery (1936), but settled in the end on the latter because I found the synopsis to be enticing. Surprisingly, the plot turned out to contain an impossible situation or two that were overlooked by Robert Adey in Locked Room Murders (1991). These seemingly impossible situations are presented as supernatural phenomenon and occur at Old Hall Farm, situated in the village of Yarham, where John Thurlow lives in the company of his niece, Eileen – an ardent devotee and practitioner of spiritualism. John is naturally "skeptical and cautious," preferring a scientific approach, but has become a tentative believer after "quite a lot of persuasion and study." He would love to experience the "spirit music," which was heard by Eileen in the old house that was "impregnated with the spirit of the bygone" and "bore the indelible imprint of the activities and designs of people since dead and forgotten" – leading to an experimental séance during which the eerie sounds of organ music are heard. A sensible and natural explanation for the spectral music proved to be as elusive as the ghosts themselves. Old Hall Farm was not equipped with a wireless or a gramophone, which were both deemed by John as a "damned annoying contraption," and the church is a mile away. So where did the ghostly bars of music emanated from? However, there a more pressing, Earth-bound questions raised directly after the séance. John Thurlow appears to have stepped out of the window of his study and simply vanished, but a more baffling problem presents itself the following day: the remains of Thurlow and Mr. Clarry Martin were found on a piece of wasteland called "Cobbler's Corner." Thurlow had his skull bashed in and Martin had been shot, but physical evidence precluded the possibility that they had murdered each other. A gentleman-painter and amateur detective of some repute, named Anthony "Algernon" Vereker, happened to be in the neighborhood to sketch and paint, but a double-murder is as good an excuse as any to take a break from the artistic process. Vereker's private enquiry looks into every person who orbited the lives of Eileen and the John Thurlow, which included a twenty-six-year old widow, Mrs. Button, who was still known locally as Miss Dawn Garford and the dead men were both vying for her affection. Arthur Orton rented the next-door property from Thurlow, called Church Farm, and he showed a great interest in both Eileen and the property, which might have given a double motive. Ephraim Noy is a mysterious individual who lives alone in a new bungalow and "about as communicative as a brick wall," but may have shared a "youthful indiscretion" with Thurlow in British India – which involved an Indian dancing girl and her murdered husband. And then there is the local amateur archaeologist, Rev. William Sturgeon, who's exploring a crypt and underground vault for King John's treasure. On an unrelated side-note, King John's treasure was a major plot-thread in a historical mystery novel I read last year: The Song of a Dark Angel (1994) by Paul Doherty. Just so you know. Anyway, Vereker alternates his role as an amateur detective with that of a ghost-hunter and personally experiences some of the ghostly events at Old Hall Farm, but the most interesting occurrence is the poltergeist activity in the late Thurlow's study: Eileen "heard the sound of footsteps" in the study and discovered upon inspection that "chairs, ornaments, clocks and the little table had all been moved," but all the doors and windows were securely locked and fastened! 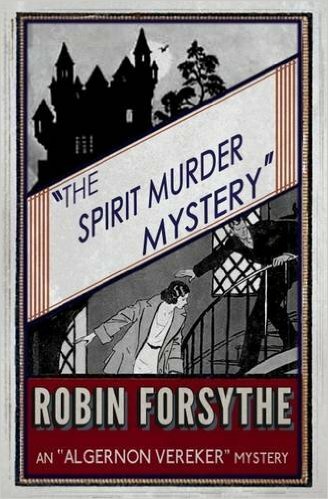 Unfortunately, the explanation for all of these apparently supernatural and impossible situations was even in the mid-1930s very dated and "rather moth-eaten," which makes it advisable to not read The Spirit Murder Mystery as an impossible crime novel. You might end up disappointed if you do. However, in spite of that, Forsythe wrings an unusual and still fresh explanation from this extremely dated and moth-eaten plot device, which showed the same streaks of originality that was so prevalent in The Pleasure Cruise Mystery. The explanation for the gunshot wound was perhaps one coincidence too much and more consideration (and time) could've been given to the circumstances in which the bodies were found (i.e. cause of death), but I found them minor drawbacks in what was a wholly enjoyable detective story. So, in the end, I think I preferred The Pleasure Cruise Mystery to The Spirit Murder Mystery, but, regardless of some flaws in the latter, I begin to become very fond of Forsythe. I don't think I'll allow his other books to linger much longer on my TBR-pile. There are only three of them left and then I still have three non-series to look forward to, which I'm sure will be reprinted sooner or later by the Dean Street Press.